The gingival thickness (GT) and plaque induced inflammation, rather than the apico-coronal width of attached gingiva and keratinized tissue, determining factors for development of gingival recession and attachment loss during various restorative and orthodontic procedures. Over a period of clinical examination, it was observed that the GT appears to differ in pigmented and nonpigmented gingiva. Based on the clinical observation, the MEDLINE search using keywords, GT, pigmented gingiva, esthetic, and plastic surgery revealed the lack of data. The clinical observation and lack of data led to the present study. The aim of the present study was to compare the GT in pigmented and nonpigmented gingiva using transgingival probing (TGP) in midbuccal area of the gingiva in the anterior segment of Indian population. Rajiv Gandhi University of Health Sciences Review Committee approved the protocol for human subjects. The inclusion criteria were (a) healthy periodontal tissues with good plaque control, gingival bleeding index (Ainamo and Bay 1975)  score of 20% and no loss of attachment, (b) physiologic gingival pigmentation (Dummet's oral pigmentation index [DOPI], 1966  - score 2-3 [heavy pigmentation]) (c) nonpigmented gingiva with DOPI-score 0 (no pigmentation) (d) presence of normally aligned anterior teeth in both upper and lower jaw. The following exclusion criteria were considered (a) pregnancy and lactation, (b) gingival recession in the anteriors, (c) systemic diseases known to cause pathologic pigmentation such as hormonal imbalance, Addison's disease, Peutz-Zegher's syndrome, Ehlrer's Dalnod's syndrome, etc., (d) extensive restorations. (e) Use of any medication possibly affecting the size of gingiva and periodontal tissues such as, phenytoin, calcium channel blockers, minocycline and cyclosporin A (f) smokers (g) tooth malposition and rotation. Mandibular DOPI/number of teeth examined. After receiving information about this study such as the objectives, its purpose and the degree of discomfort that might occur, the subjects gave their informed consent. In the first visit, plaque index  and gingival bleeding index  were recorded followed by scaling and polishing. A single calibrated examiner recorded the measurements. The study period was from 6 to 12 months. The GT was assessed mid-buccally in the attached gingiva, half way between mucogingival junction and free gingival groove. The thickness of gingiva was assessed tooth wise that is, at central incisor, lateral incisor and canine by TGP. The measurement points on the facial gingiva were marked with a marking pencil prior to probing. The GT was assessed by anaesthetizing the facial gingiva with xylonar spray (lignocaine 15.0 g) and if required, infiltration was done using 2% lignocaine HCl with 1:80,000 adrenalin injection. Using a UNC-15 probe the GT was assessed at the measurement points 20 min after injection. Measurements were then rounded up to the nearest 0.5 mm. The results of this study were subjected to statistical analysis [Figure 1]. The plaque index was compared between nonpigmented and pigmented gingiva and the mean was found to be 1.32 ± 0.34 and 1.51 ± 0.26, respectively. The P = 0.13, which is nonsignificant. The thickness of gingiva was compared between nonpigmented and pigmented gingiva and the mean was found to be 0.99 ± 0.31 and 1.16 ± 0.23, respectively. The P < 0.001, which was highly significant [Table 1] and [Table 2]. In recent years, dimensions of different parts of masticatory mucosa, especially GT has become a subject of considerable interest in dentistry, both from epidemiologic, aesthetic and therapeutic point of view. Apart from periodontics, thickness of gingiva seems to be of significance in various other specialties like orthodontics, prosthodontics and implantology as it is an issue of concern in aesthetic and functional outcome of the respective treatment. The gingival dimension needs to be addressed as both gingival width and thickness. So far in the periodontal literature, the gingival width has been discussed to great extent and the gingival recession occurrence has been widely associated with adequate or inadequate width of attached gingiva. The GT also plays an equally important role in the gingival margin position; unfortunately, the periodontal literature attributes limited importance to GT when compared to gingival width. The actual functions of attached gingiva such as resistance to masticatory/tensional/traumatic forces and inflammation are possibly directly related to thickness as much as width of gingiva. Hence, there is a need to measure GT along with other gingival parameters. The results of this study are discussed as follows: In this study, plaque level was similar in both pigmented and nonpigmented gingiva groups. The pigmented GT (1.16 ± 0.23) was significantly higher than nonpigmented gingiva (0.99 ± 0.31) using transgingivalprobing method. A search of the current literature fails to reveal any studies comparable to the present investigation that is comparison of GT between pigmented versus nonpigmented gingiva. Consequently meaningful comparisons are not possible. Vandana and Savitha  conducted a study to determine the thickness of the facial gingiva among Indians and its association with age, gender and dental arch. The study group included 16 males and 16 females with an age range of 16-38 years. GT was assessed in the maxillary and mandibular anteriors by TGP. It was observed that the younger age group had significantly thicker gingiva than that of older age group. The gingiva was found to be thinner in females than in males and dental arch comparison of GT demonstrated thicker gingiva in the mandible than in the maxilla. The mandibular midbuccal (1.07 ± 0.3) was thicker than the maxillary gingiva (1.00 ± 0.32) however no distinction was made as pigmented and nonpigmented gingiva in their study. A study was conducted by Mόller et al. in which the thickness of the gingival margin was based on visualization of probe, while sulcus probing. The inherent disadvantage of this method is lack of such visualization, while probing pigmented gingiva: Only the pink gingiva, which is less prevalent in Indian population, would allow such recording. For clinical situation, the attached gingiva is considered than gingival margin. Considering the site specificity issue of periodontal disease, the numbers of sites included are adequate. Few authors illustrate the significant value of site specific monitoring in periodontal diagnosis and treatment planning especially in management of localized periodontal lesions. , The pigmented gingiva is common in Asian race. The thickness of gingiva plays an important role in predicting the occurrence of gingival recession. During interdisciplinary approaches, due consideration to thickness of gingiva would benefit the patient in preventing occurrence of iatrogenic gingival recession due to ortho movement, crown and bridge treatment, implant placement. The necessity to surgically create/improve gingival width and thickness prior to interdisplinary approaches would be a good decision making plan. Measurement of gingival dimension is clinically meaningful for both academicians and periodontists. Those academicians or clinicians who record GT measurement regularly could understand the outcome measures meaningfully. The diagnostic ability of GT measurement is recommended to distinguish bony and gingival enlargement. The prognostic ability of GT measurement is also appreciable in inflammatory induced clinical changes as well as those induced due to fibrosis. Along with recording of color, consistency, texture, position of gingiva, GT measurement is a useful simple tool for disease and treatment outcome measurement. Further, the study should be expanded using larger sample size in different races of global population and longitudinal studies can be considered for further investigation in this regard. Second, histologic evaluation can throw more light on reason for increased thickness of pigmented gingiva. Third, gingival dimension measurement includes both GT and width, which influences the gingival margin position. The clinical studies are incomplete without recording both gingival width and thickness. The inadequacy of gingival dimension should be analyzed in terms of both thickness and width of the attached gingiva. The various combinations of thickness and width of gingiva would be responsible for occurrence of gingival recession, which needs to be addressed in clinical trials, especially in periodontal regenerative techniques. The profound influence of gingival dimension on gingival margin position, probing depth and clinical attachment levels, is obvious in root coverage and regenerative clinical trials. The clinicians should pay valid importance to basic measurement such as gingival dimension along with molecular growth in periodontology. The interdisciplinary concept gets meaningful by gingival dimension measurement. The measurement of GT and width is highly recommended in periodontal regenerative trials. The gingival thickness (GT) measurement using transgingival probing (TGP) is recommended. During interdisciplinary approaches, due consideration to thickness of gingiva would benefit the patient in preventing occurrence of iatrogenic gingival recession due to ortho movement, crown and bridge treatment, implant placement. The thickness of gingiva plays an important role in predicting the occurrence of gingival recession. Surgical improvement of gingival width and thickness prior to interdisplinary approaches would be a good decision making plan. Measurement of gingival dimension is clinically meaningful for both academicians and periodontists. Those academicians or clinicians who record GT measurement regularly could understand the outcome measures meaningfully. The diagnostic ability of GT measurement is commendable to distinguish bony and gingival enlargement. Depending on the clinical situation, bone or gingiva alone or combination of bone and gingival enlargement could be ascertained clinically by careful TGP. The prognostic ability of GT measurement is also appreciable in inflammatory induced clinical changes as well as those induced due to fibrosis. A simple method of TGP is cost effective and dependable although arduous and time consuming when compared to assessment of gingival crevicular fluid markers to assess to prognosis, which can be reserved for unresponsive cases or those due to systemic causes. It should be mandatory to record GT for all periodontal surgical procedures as the common outcome such as recession depends on the GT. Along with recording of color, consistency, texture, position of gingiva GT measurement is a useful simple tool for disease and treatment outcome measurement. For this reason, detailed knowledge of thickness is mandatory. Regarding implant therapy, the keratinized mucosal thickness and width around dental implants affects both the clinical and the immunological parameters at these sites. These findings are of special importance in the esthetic zone, where narrow and thin KM may lead to greater mucosal recession. Implants installed in patients or at sites with thin mucosal tissues would show increased peri-implant bone loss. This study confirmed the observational finding of pigmented gingiva being thicker (1.16 mm) when compared to nonpigmented gingiva (0.99 mm) of the Indian population using TGP, which is the definitive clinical diagnostic method. The possible limitation is the invasive nature of TGP. The external validity of the present study is satisfactory. 1. 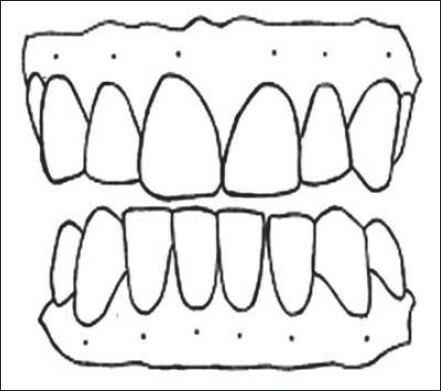 Müller HP, Eger T. Gingival phenotypes in young male adults. J Clin Periodontol 1997;24:65-71. 2. Müller HP, Eger T. Masticatory mucosa and periodontal phenotype: A review. Int J Periodontics Restorative Dent 2002;22:172-83. 3. Anderegg CR, Metzler DG, Nicoll BK. Gingiva thickness in guided tissue regeneration and associated recession at facial furcation defects. J Periodontol 1995;66:397-402. 4. Uchida H, Kobayashi K, Nagao M. Measurement in vivo of masticatory mucosal thickness with 20 MHz B-mode ultrasonic diagnostic equipment. J Dent Res 1989;68:95-100. 5. Kydd WL, Daly CH, Wheeler JB 3rd. The thickness measurement of masticatory mucosa in vivo. Int Dent J 1971;21:430-41. 6. Zigdon H1, Machtei EE. The dimensions of keratinized mucosa around implants affect clinical and immunological parameters. Clin Oral Implants Res 2008;19:387-92. 7. Ainamo J, Bay I. Problems and proposals for recording gingivitis and plaque. J Int Dent 1975;25:229-35. 8. Dummett CO, Gupta OP. The DOPI assessment in gingival pigmentation. J Dent Res 1966;45:122. 9. Silness J, Loe H. Periodontal disease in pregnancy. II. Correlation between oral hygiene and periodontal condtion. Acta Odontol Scand 1964;22:121-35. 10. Goaslind GD, Robertson PB, Mahan CJ, Morrison WW, Olson JV. Thickness of facial gingiva. J Periodontol 1977;48:768-71. 11. Wara-aswapati N, Pitiphat W, Chandrapho N, Rattanayatikul C, Karimbux N. Thickness of palatal masticatory mucosa associated with age. J Periodontol 2001;72:1407-12. 12. Vandana KL, Savitha B. Thickness of gingiva in association with age, gender and dental arch location. J Clin Periodontol 2005;32:828-30. 13. Müller HP, Schaller N, Eger T, Heinecke A. Thickness of masticatory mucosa. J Clin Periodontol 2000;27:431-6. 14. Schätzle M, Löe H, Lang NP, Heitz-Mayfield LJ, Bürgin W, Anerud A, et al. Clinical course of chronic periodontitis. III. Patterns, variations and risks of attachment loss. J Clin Periodontol 2003;30:909-18. 15. Persson GR. Site-based versus subject - Based periodontal diagnosis. Periodontol 2000 2005;39:145-63.